Rehabilitation/Physical therapy and Stress reduction. As of 2007 it was estimated that approximately 300,000 of the 1.64 million American service members that were deployed were suffering from Post Traumatic Stress Disorder (PTSD). It is also estimated that over 300,000 individuals experienced a possible traumatic brain injury (TBI) during their deployments. Based on these estimates the levels of PTSD and TBI cases occurring among our soldiers in today's modern wars is in excess of 30 percent. PTSD and TBI share common symptoms: difficulty concentrating, memory problems and irrability, but TBI symptoms can also include headaches, dizziness and balance problems. A person with PTSD may have nightmares, re-experience traumatic events and have an anxiety that worsens. Cathy Melmick, Deputy of Clinical Affairs stated that a differnce of the two is that diagnosis of TBI is usually made when a person is first injured. Treatments for both are very much alike. They both include sleep, good nutrition and support. Our military is experiencing a growing problem. 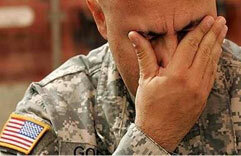 One in 5 soldiers returning from active duty suffers from PTSD. This comes directly from an Army study of mental health of our troops that fought in Iraq. Charles Hodge who was one of the researchers at Walter Reed Army Institute of Research said, 'A particular concern is that troops with problems are not seeking care. 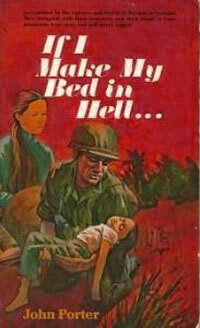 Once called shell shock or combat fatigue, PTSD can develop after witnessing or experiencing any traumatic event. Symptoms include flash backs, nightmares, feelings of detachment, irritability, trouble concentrating and insomnia. It is estimated that 70% of our soldiers and veterans will not seek help from Federal agencies. A recent study showed that military participants were afraid to seek assistance for PTSD because fears that a Scarlet "P" would doom their careers. Charles Hodge, a researcher from Walter Reed Institute of Research stated: " The most important thing for service members who have fought in combat is that the earlier they get help when they need it, the better off they'll be. Paula Schnurr, who is deputy executive director of the VA'S National Center for Post Traumatic Stress Disorder, said that PTSD involves changes in a person's psychological and neurobiological states. She said, 'their brain changes. The systems in the brain that help us deal with stress and regulate fear and emotional responses are changed as you might expect in response to the extreme trauma of combat'. She goes on to state – 'its normal for people exposed to a life threatening event to experience fear, shock, and horror for the hours and days that follow. Its when when the symptoms persist past 30 days, there is a problem. More severe exposure to combat stresses will result in greater likelihood of PTSD'. According to Representative Harold Naughton, the public tempo of the current wars has exposed troops to combat for upward of 200 days at a time, for longer periods of uninterrupted combat exposure than most troops experienced in World War II or Vietnam. According to Paula Schnurr, what happens to a person after their trauma makes a big difference. A supportive recovery environment, an absence of stress and further stresses can all be protective. Conversely, returning to further stresses, having additional traumas, marital difficulties, job problems and the like can make the situation more difficult, ' It is therefore critical that upon return from combat our service members receive immediate and effective attention to prevent a lifetime of suffering and dysfunction'. 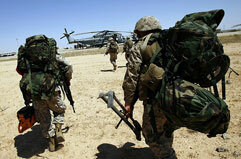 Traumatic Brain injuries are the most common wounds sustained in Iraq and Afghanistan. TBI's that occur in combat are often complex. Sudden air pressure changes following a blast cause an internal and external injury, the explosion can injure the brain, producing concussions or contusions. Injuries can be made worse by flying fragments, then more damage can occur when a soldiers body is physically propelled, possibly hitting the head against another hard surface. A TBI is defined as an insult to the brain caused by external force which may produce a diminished state of consciousness, resulting in impaired cognitive abilities and physical functioning. These changes can include problems with thinking, sensation, movement, language and concentration. Brain injury can result in personality and emotional changes, irritability, tiredness, depression, violence and the inability to carry out basic everyday tasks. Kent Cicerone, a leading rehabilitation researcher and Director of Neuropsychological at JFK Johnson Rehabilitation Institute said, "The longer our soldiers go without therapy for TBI, the greater likelihood there is of falling into a mental diffuse syndrome, where the brain is not being used at the same level. "The brain is in essence going to developed bad habits," states Cicerone. 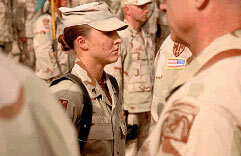 As more of our soldiers come home from war, TBI will become a growing problem. Those who go untreated may find symptoms worsening with risk for depression, problems performing everyday tasks, substance abuse, severe anxiety, etc., making them unable to take care of themselves or their families. Further problems include the lack of existing military doctors and programs to treat them. 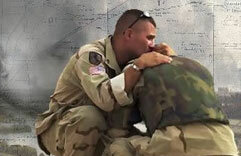 Our returning veterans desperately need treatment for Traumatic Brain Injury and Post Traumatic Stress Disorder. OTANY Retreat will specialize in treating both. Our service members will have the opportunity for involvement in a total spectrum of programs including, Stress reduction, Counseling, Physical therapy, Equine therapy, Cognitive rehilbilatation and a variety of activities that can advance cognitive skills. We will also offer programs for detoxification, general health, relaxation, nutrition and fitness. 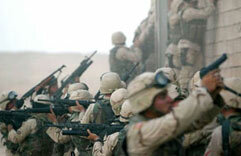 Large numbers of soldiers who were in the Persian Gulf, have developed Gulf War Syndrome. Veterans symptoms include severe and frequent headaches, debilitating fatigue, muscle and joint pains, memory problems, respiratory ailments and asthma, chronic diarrhea, loss of bladder control, etc. Their chronic health problems and the extreme sensitivity they have developed to common everyday chemicals make it difficult or not possible for them to work. Some of the toxic chemicals that our troops may have been exposed to include: Low levels of sarin and other nerve gases released (from the bombing of Iraqi chemical weapons factories and the destruction of bunkers where these weapons were stored) PB pills (given to soldiers to protect them from nerve gas) Excessive use of pesticides, Radioactive dust from Depleted Uranium (DU) munitions, Anthrax and other vaccines given in compressed time frame(reference: Gulf War Syndrome: Aftermath of a Toxic Battlefield -Alison Johnson). 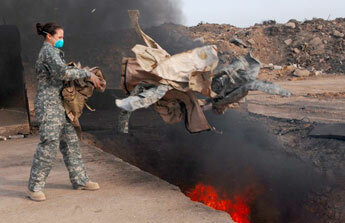 More recently, US installations in Iraq and Afghanistan have burn pits. The burn pit at Balad has burned Styrofoam, Petroleum products, Plastics, Rubber, Unexploded ordinance, Dining facility trash, Paint and solvents, Amputated limbs and medical waste, etc. Our troops may also have been exposed to poisonous contaminants that include Arsenic, Carbon monoxide, Formaldehyde, Hydrogen cyanide,Benzene, Depleted uranium, and others. When plastic bottles are burned, it creates elevated levels of toxic dioxins. Medical or human waste can create dangerous aerosols. Wood and paper garbage can cause harmful effects to the skin. OTANY Retreat's Detoxification Program, has been proven to remove toxins from the body quickly and efficiently. Our service members need to be treated as soon as possible to prevent future problems and disease. According to an article by Elizabeth Weize, more than half of US soldiers that had been medically evacuated from Iraq and treated at two of the military's largest pain centers suffered from bad backs. Captain Brian Karqus who served with the 101st Airborne Division in Iraq said, 'Soldiers face high stress conditions, combined with sleeping on cots with little back support, standing on their feet for hours at a time, riding in convoys in crunched positions and wearing heavy armor, all of this contributes to back problems". 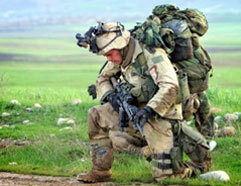 Soldiers are required to carry very heavy loads on their backs day after day over periods of time. The amount of equipment and the weight that a soldier must bear has been increasing (from 95 pounds to 135 pounds). Carrying these loads over repeated combat tours is causing many musculoskeletal injuries. When service members are injured they become non-deployable. For all of these reasons many soldiers may suffer with long term injuries. There is no guarantee that they can return to active duty and in a lot of cases must be deployed to different jobs to stay in the army. Peace Chapel and OTANY Retreat will offer a variety of specialized rehabilitation programs developed in response to soldiers returning from active duty with musculoskeletal injuries.